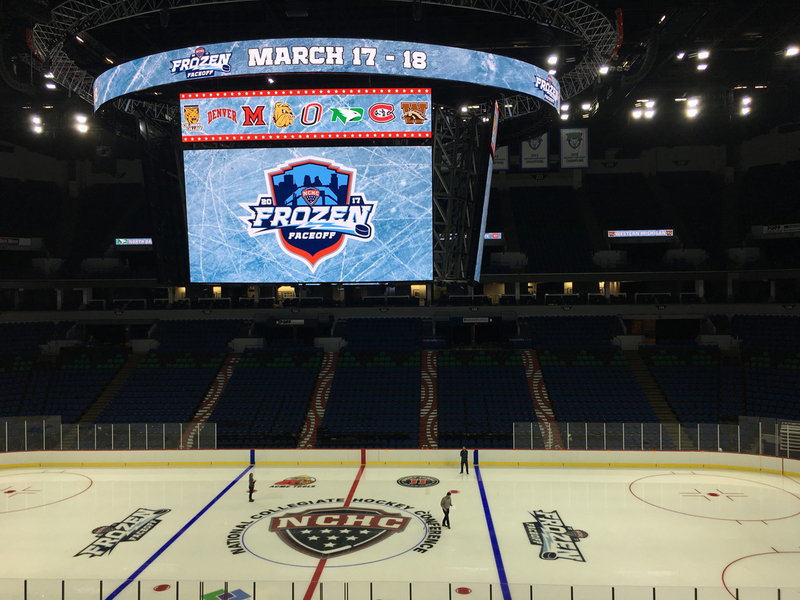 It's Frozen Faceoff weekend 2017 and the Target Center again plays host, this time with some new equipment! For this blogger, it's truly the most wonderful time of the year. Welcome to Frozen Faceoff weekend 2017! Of the four teams skating for the National Collegiate Hockey Conference tournament trophy this Friday and Saturday at the newly-renovated Target Center in downtown Minneapolis (check out that scoreboard! ), only one isn't assured to be playing past their time at the Frozen Faceoff. Denver, Minnesota Duluth and Western Michigan have done enough to this point in the season to guarantee a spot in the NCAA tournament when it starts next week. The UND men's hockey hasn't gotten there quite yet. However, as noted in Grand Forks Herald hockey writer extraordinaire Brad Schlossman's blog, the Green and White can lock up their 15th-straight NCAA tournament berth with a win this weekend. With all scenarios run, UND would get in 100% of the time with at least one win at the Frozen Faceoff, but two losses would still have them in the tournament in 90% of the scenarios. With that being said, the Green and White don't want to take any chances. UND has had plenty of struggles in the Target Center since the berth of the NCHC and with another expected large gathering of Green and White (Hello, St. Patty's Day! We'll get back to what St. Patty's day weekend means to UND a bit later) in the stands, could this be the year North Dakota finally breaks through in Minneapolis? While the other three teams have less to play for in terms of the season, clearly, no team wants to back into the national tournament with a loss and playing for a trophy is always a big deal in a conference like the NCHC. This weekend has four of the best teams in college hockey, including three potential No. 1 seeds for the NCAA tournament and it will certainly be fun to watch. Can UND keep riding Baby DDC No. 2's magic with their four-game post birth winning-streak? What is DDC watching for this weekend? Check out his "Who? What? How?" Frozen Faceoff preview and see who he thinks will skate away from the Target Center hoisting some hardware. scoring offense with 38 points. Fr. F, Henrik Borgstrom, 21 goals, 17 assists -- 38 points; So. F, Dylan Gambrell, 11g, 26a -- 37 points; So. F, Troy Terry, 19g, 17a -- 36 pts; Sr. D, Will Butcher, 6g, 29a -- 35 pts; Sr. G., Tanner Jaillet, 24-4-4, 1.84 Goals Against Average, .929 Save Percentage. So. F, Shane Gersich, 21g, 16a -- 37 pts; Fr. F, Tyson Jost, 15g, 16a -- 31 pts; So. F, Brock Boeser, 15g, 16a -- 31 pts; Jr. D, Tucker Poolman, 7g, 23a -- 30 pts; Jr. G, Cam Johnson, 19-11-3, 2.39 GAA, .904 SV PCT. Sr. F, Alex Iafallo, 17g, 24a -- 41 pts; So. F, Adam Johnson, 16g, 15a -- 31 pts; So. D, Neal Pionk, 7g 22a -- 29 pts; Fr. F, Joey Anderson, 9g, 19a -- 28 pts; Fr. G., Hunter Miska, 22-4-5, 2.22 GAA, .917 SV PCT. The Pioneers lead the NCAA in scoring defense, allowing just 1.84 goals per game and are 10th best scoring offense at 3.39 goals per game. Freshman forward Henrik Borgstrom, the newly-minted NCHC Rookie of the Year, is tied for second in the NCAA with six game-winning goals. Senior defenseman Will Butcher was named a Hobey Baker Finalist, the lone pick for the NCHC as well as the conference's Player of the Year. The Green and White are 14th in scoring in the NCAA at 3.24 goals per game and are T-20 in scoring defense, allowing 2.59 goals per game. During UND's four-game winning streak, junior forward Trevor Olson has the game-winning goal in three of those games. Freshman forward Tyson Jost is one of six rookies in the NCAA averaging at least 1 point per game. Jost has a 1.03 point per game average. The Bulldogs are 11th in the NCAA in scoring offense with 3.36 goals per game and are 10th in scoring defense, allowing 2.28 goals per game. 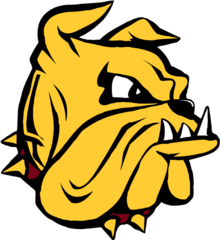 UMD has struggled to a paltry 80.4% penalty kill rate which slots them as No. 41 in the NCAA. Freshman goaltender Hunter Miska is fourth in the NCAA in winning percentage at .790 and in shutouts with 5. The Broncos have the 8th-best scoring offense (3.41 goals per game) in the NCAA and power play (21.8%). Freshman goaltender Ben Blacker has the 6th-best winning percentage in the NCAA at .750. WMU has struggled on the penalty kill, this season, stopping just 81.5% of opponents power plays. This ranks them 39th in the NCAA. No. 1 Denver (PWR: 1, 28-6-4, No. 1 seed in NCHC tournament) swept Colorado College 4-1, 4-0 in the first round of the NCHC tournament. The Pioneers are on a NCAA best 13-game winning streak. No. 11 UND (PWR: 11, 20-14-3, No. 4 seed in NCHC tournament) swept SCSU 5-2, 6-5 (OT) in the first round of the NCHC tournament. UND has won five of their last six games after winning just three of the previous 10. No. 3 Minnesota Duluth (PWR: 2, 23-6-7, No. 2 seed in NCHC tournament) swept Miami 5-4 (OT) and 5-3 in the first round of the NCHC tournament. The Bulldogs are 6-1-3 in their last 10 games. No. 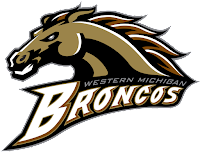 8 Western Michigan (PWR: 4, 22-10-5, No. 3 seed in NCHC tournament) beat No. 6 seeded Omaha in three games at home during the NCHC first round. Won Saturday and Sunday after falling on Friday. Sunday's win came 34 seconds into overtime when Michael Rebry netted the game winner. DDC likes the Bulldogs in this one. UMD is loaded up front with senior Alex Iafallo and and sophomore Adam Johnson leading the way and defenseman Neal Pionk is a dynamic playmaker in front of freshman netminder Hunter Miska who is 4th in the country in shutouts. The Bulldogs dominated UND in their four games this year and DDC is of the opinion that they are the best team in college hockey right along with Denver. With that being said, Western Michigan is having a tremendous year with a power play that can break a game. If WMU can slow down UMD's depth, this could go the way of the Broncos, but DDC thinks the Dogs take this one. THE BULLDOGS HEAD TO THE TITLE GAME, 5-2. The stats scream Denver, but DDC is a homer and all of my readers know that. There are certainly many factors in this particular pick, but DDC just has a hunch here. That hunch comes from two things -- UND's Baby DDC No. 2 birth magic and their 4-0 current run and the luck of the Irish. The luck of the Irish, you say, DDC? What do you mean?! Well, think back, UND fans... when was the last time the Green and White took over the Twin Cities for a conference championship tournament during St. Patrick's Day weekend? 2012. You all remember what happened that weekend, don't you? Here's a hint that only needs two words ... The Timeout. There is it. The luck of the Irish. The luck of the green. The 2012 WCHA Final Five is one of DDC's favorite tournaments he can remember. A special and incredibly memorable weekend. Is magic really in the air, this weekend in Minneapolis? Let's look at this without bias, shall we? Denver is good. Really good, in fact. The Pioneers are No. 1 in the NCAA for a reason. They sport the NCAA's lowest goals against average (1.84) and are 10th in scoring. Freshman Henrik Borgstrom (NCHC rookie of the year) and sophomore Dylan Gambrell are two of the NCHC's best forwards and senior defenseman Will Butcher is the conference's only Hobey Baker finalist and was named the NCHC player of the year. 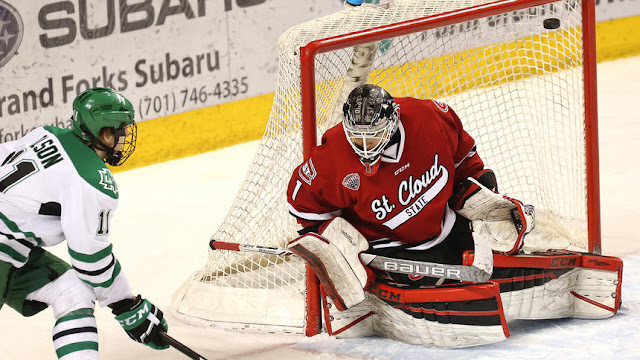 Goaltender Tanner Jaillet was named the NCHC Goaltender of the Year, to boot. On paper, DU is the better team. With all that said, DDC loves how UND is playing right now. They've found an effort level that has found them tough to beat, right now. Couple that with the play of their best players (Jost, Boeser, Gersich, T. Poolman and Poganski) over the last few weeks and the Green and White are poised for a big weekend. North Dakota knows they are one win away from the NCAA tournament and DDC expects them to play desperate. Forget that the Green and White have yet to win a semifinal game at the Frozen Faceoff. Forget that DU has won a NCAA best 13 straight games. Forget that UND has been up and down this season. The Green and White need one win this weekend to clinch a berth into the NCAA tournament and rightfully defend their national championship. The luck of the Green and of Baby DDC No. 2 continues in this one. UND BREAKS OUT OF THEIR TARGET CENTER SEMIFINAL FUNK, 4-2. See all above. Note that UMD has beaten UND four times this season. Forget that. THE MAGIC CONTINUES ... UND TAKES THE NCHC TOURNAMENT TROPHY, 4-3. There you have it, college hockey fans. Enjoy the weekend. goals in three of the last four games for UND. Photo Credit: Jesse Trelstad, Grand Forks Herald. As mentioned in DDC's preview of the first round National Collegiate Hockey Conference series between the UND men's hockey team and St. Cloud State, DDC Baby No. 2 was born March 1st. Since that wonderful day in DDC's life, the Green and White has seen two new heroes come to the forefront -- junior forward Trevor Olson and DDC Baby No. 2. Following a 5-2 win on Friday, Olson netted the game-winning goal at 7:38 of the OT period in a wild and memorable game at Ralph Engelstad Arena as UND swept the Huskies to advance the Green and White to the Frozen Faceoff in Minneapolis this coming weekend. Since DDC Baby No. 2's birth, UND was won four-straight games and Olson has the deciding tally in three of those games. North Dakota handled St. Cloud fairly handily on Friday, but the old adage "it's hard to end a team's season" held true on Saturday as the Huskies brought a tremendous effort. The game was tied 1-1, 2-2, 3-3, 4-4 and 5-5 before Olson potted the winner in OT. After a Shane Gersich goal made it 4-3 halfway through the third period, St. Cloud State continued to come at UND, tying the game just 1:02 later and took the lead just 1:44 after that. But, the Green and White had the magic of Baby DDC No. 2 in their pocket as Christian Wolanin knotted the game at five with 4:02 to go. During the intermission before the overtime period, fans at the REA were treated to bonus coverage of the UND men's basketball team's overtime winning effort in the Big Sky tournament finals that punched the Green and White's first-ever ticket to the NCAA tournament over Weber State, sending the fans into a frenzy that continued with Olson's winner in OT. Baby DDC No. 2's magic was too strong for the Huskies and Weber State, for that matter. Here's what stood out to DDC as UND notched wins No. 19 and 20 and moved one step closer to the NCAA tournament. While UND's depth has been a huge part of their last handful of games where they've won five-of-six, come playoff time, teams that compete for NCAA titles need to have their best players be their best players, each night. This was definitely the case this weekend for the Green and White. UND's top five point producers, Shane Gersich, Brock Boeser, Tyson Jost, Austin Poganski and Tucker Poolman all had multiple point weekends. Boeser returned to the lineup after missing the previous weekend in Miami and scored in both games. Gersich and Poganski also both scored in both. With the development of depth players increasing each game, having these five players rolling will prove large for UND as the look to continue to advance. As just mentioned, UND's depth players are turning dividends for the Green and White, of late. Along with Olson's game winner, junior Johnny Simonson and freshman Cole Smith both assisted on the game-tying goal by Christian Wolanin and did the same on Olson's series-clinching goal. Simonson fired the puck from the side boards toward the net and Olson got his stick on it to get the winner. The line of Smith, Simonson and Olson had a tremendous weekend, playing with edge and pace that St. Cloud had trouble containing. UND will be a tough out the rest of the way if this trend continues. DDC Baby No. 2's magic is pretty evident to this blogger. A wee bit biased, you say? No. You're wrong. DDC Baby No. 2 is clearly a UND sports Godsend. You'll need a Facebook account to get to it and the video is about halfway down the page. Big props to the UND men's basketball team. While it was done in victorious fashion, it's always a sad moment each season to know that the Palace on the Prairie will be closed for games until October. While UND struggled at times at home this season, The Ralph is always a true home advantage for the Green and White. Senior Gage Ausmus and Matt Hrynkiw as well as any underclassmen that leave after the season, helped send the REA faithful happy one more time. Here's to hoping there's another ceremony at The Ralph in about three weeks. Thanks for reading and check back later this week as DDC previews the Frozen Faceoff at the Target Center in Minneapolis.